Train up and maintain your sales strength with specialty sales programs based on the Urgency Based Selling® system. These programs work well independently or as part of a custom-designed program of solutions. Often requested by clients, the Urgency Based Selling® 8 Week Jumpstart features key components of the full Urgency Based Selling® program. Each day begins with a one-hour team seminar, followed by one-to-one sessions with each sales team member and the team manager. Each week, the ideas presented are reinforced with a business development assignment each team member must complete. You will see immediate changes in attitude, effort and results. Jump on this opportunity! Schedule your 8 Week Jumpstart. Business Development is usually a 3-12 month project. As a society, we are poor long term project managers. When you combine a long term project with poor project management, you get a train wreck. And very few new customers. A strong solutions is: the battle plan. To see the 50 seconds video, please click here to learn more. Jump on this opportunity! Schedule your Battle Plan program. What would happen to your business if every sales call was more effective? Jump on this opportunity! Schedule your One Day Sales Improvement Program. Is there a way to reinforce the learning mindset and transform team members with a fixed mindset in advance of a sales training and development program? When a company hasn’t emphasized securing proper testimonials, the testimonial project can accomplish this goal. 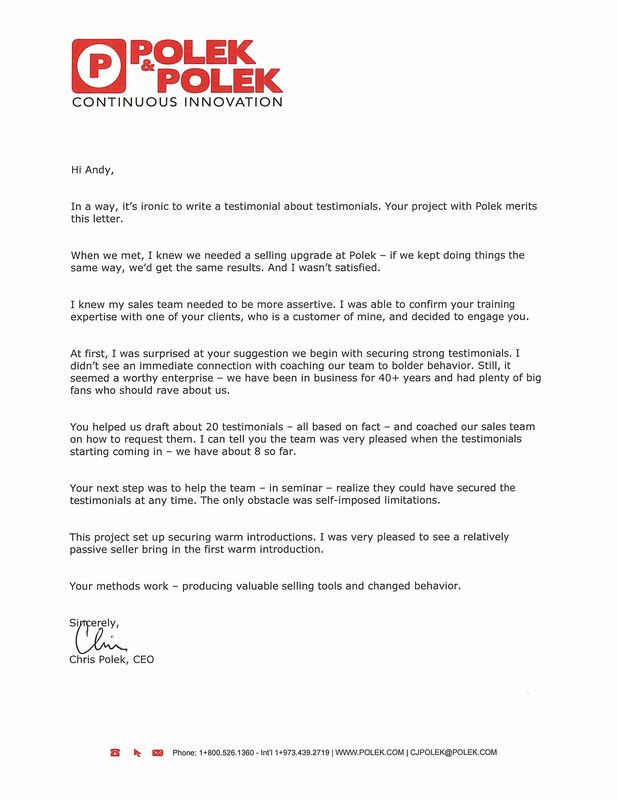 For a testimonial letter about the program, please click here. Share valuable sales expertise with clients and prospects. Ask great diagnostic questions. 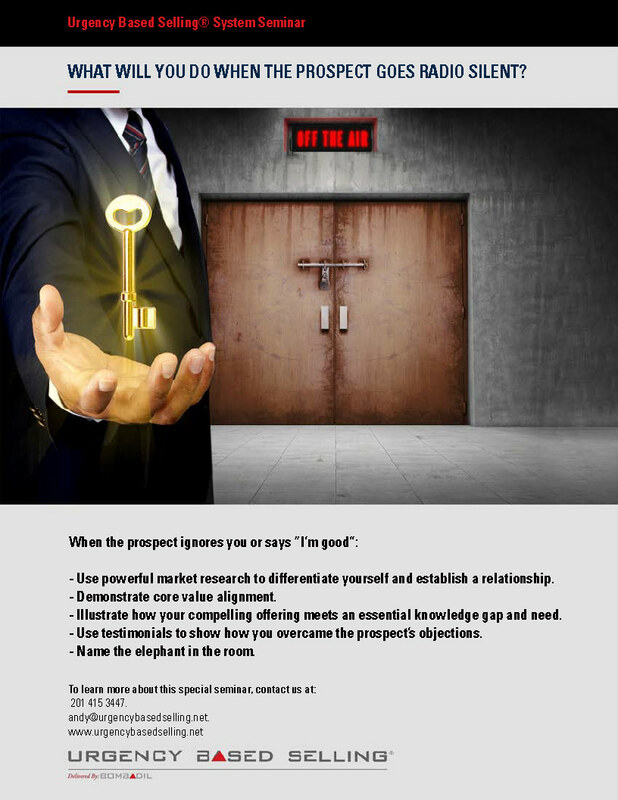 The Step by Step process to warm of up the prospect, learn their urgent needs, determine if you “have a fit”, then demonstrate the fit to the prospect and close the sale. To learn more, please click here. Jump on this opportunity! Schedule your Standard Sales Call assessment. 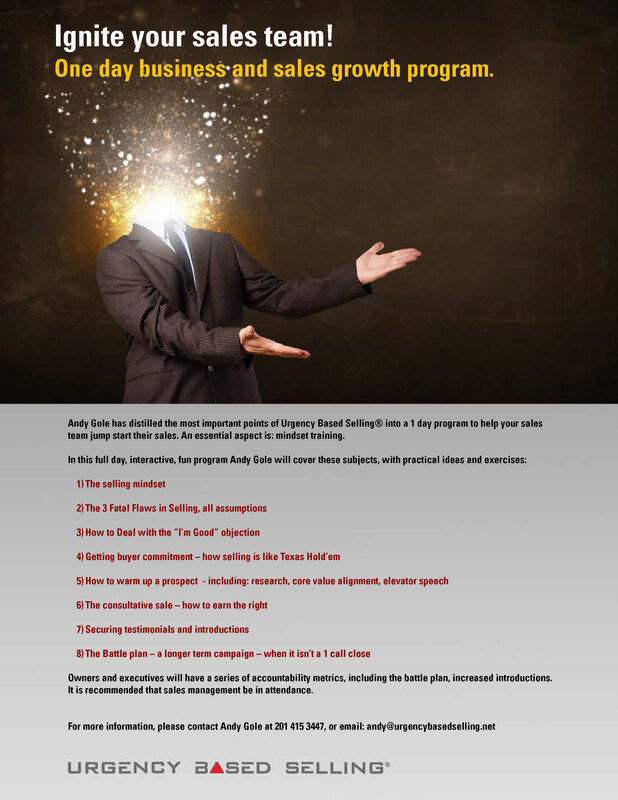 Imagine having all essential selling knowledge, tools and process in one place – as a both an instructional guide and a brainstorming book – to help sales team members when they are stuck. For more info, please click here. Jump on this opportunity! 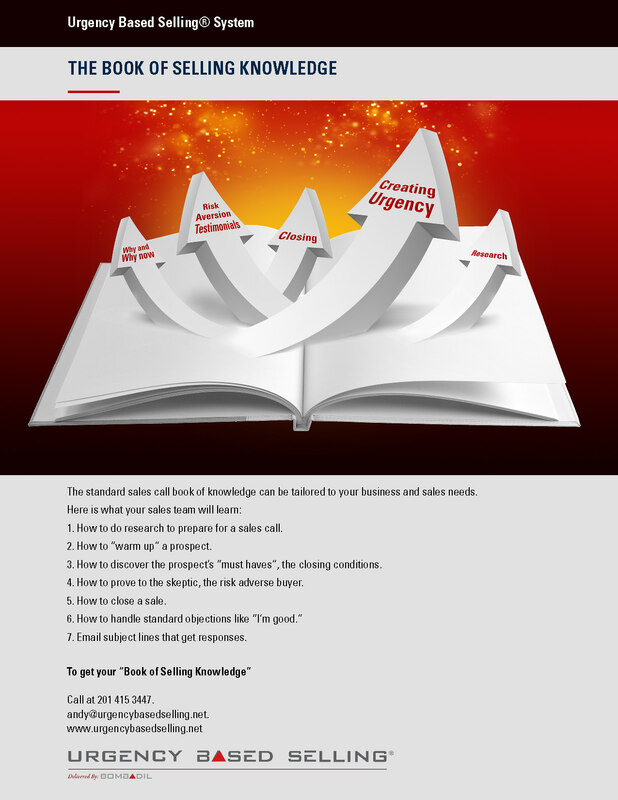 Schedule your Book of Knowledge assessment. For a video, please click below. What do you do when the prospect says “I’m good” or goes “radio silent”. In this interactive seminar, we share selling techniques which work – opening doors, re-engaging the radio silent prospect. Jump on this opportunity! Schedule your ‘radio silent’ program. Don’t let sales flat-line! Ensure the health of your company with an Annual Sales Checkup. Profit oriented, evaluating, and managing the business case? Establishing and managing by a standard selling product, a standard sales call? Scheduling effective one-to-one coaching with salespeople, with enough frequency? Teaching sales as project management? Selling with bold vision, bold behavior? Business sellers (vs. social sellers)? Committed to Do or Die (vs. best efforts)? Aligned with the company’s risk tolerance? Securing enough prospect introductions and customer testimonials? Following the company selling process, using the selling tools, and documenting in CRM? Sales management, with coaching in strong one-to-ones? Selling tools development, including developing and evolving the Proving Kit? Design of a proper selling system? Documentation of the selling process, and incorporating it into your company’s Book of Business? A plan for closing any material gaps?